Achieving profitability and success goes beyond just filling a need in the market. For contractors especially, the teams, skills, and leadership that they chose to employ on projects have a direct impact on their bottom line. In a bid to make sure that they have the right talent in place, more and more contracting companies are actively seeking and adding veterans to their workforce. This is because it is becoming more apparent that hiring veterans is good for business. 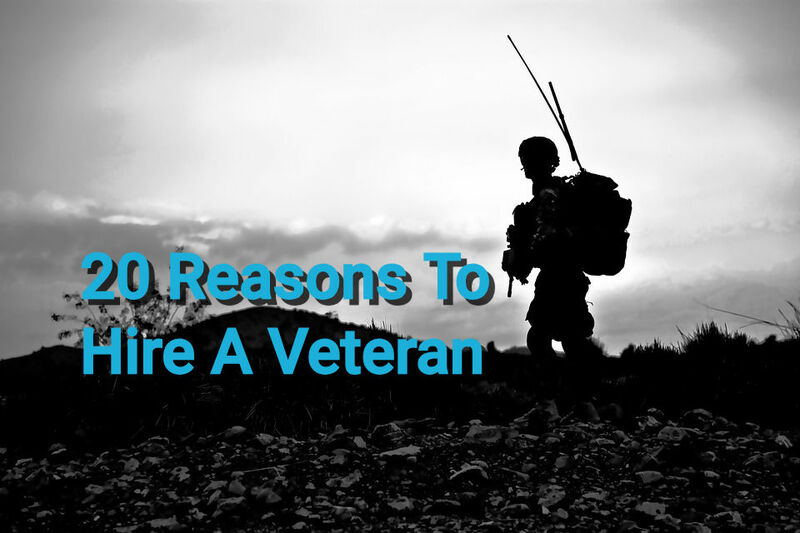 The following are the top twenty benefits of hiring veterans. Soldiers are trained to complete missions at all costs. This is a trait that is ingrained in anyone who has ever served. Thus, they will do everything in their power to get the task you have given them done. They are not likely to complain about working long hours or missing their breaks if there is a job that needs to be completed immediately. The Special Employer Incentives Program enables U.S. employers to hire qualified veteran trainees at apprenticeship wages. An employer is also reimbursed up to half of the vet’s salary to cover certain expenses. The roles and responsibilities of a soldier can change at a moment’s notice, and this happens a lot. For instance, Marines can be deployed for peacekeeping mission only to end up receiving orders that they should carry out relief efforts. Without any prior arrangements for that sort of thing, they can assume their new responsibilities. Serving in the military often requires one to learn on the job. This makes veterans especially easy to teach new ideas to. In line with their ability to learn quickly, veterans are also able to adapt to situations relatively comfortably. Sometimes, a situation might arise that makes routine work different or more difficult. Veterans can transition to the new environment relatively easily. In addition to embracing new situations as they arise, veterans also proactively seek out solutions that would make the new work situation easier to handle. Veterans are adept at working smarter, not harder. If they cannot figure out the answer to a problem, they will find someone who does and get things fixed. Veterans understand the importance of cooperation and working like a well-oiled machine. Often, in the field, a small slip from one team member could result in catastrophic consequences. Their willingness to be part of a group that works as a cohesive unit to ensure success is what makes veterans perfect team members. Soldiers often work side by side with individuals regardless of their race, gender, religion, economic status, or ethnic background. This allows them to cooperate with many different types of individuals. Upon entering the military, servicemen are required to take the ASVAB test which is used to align a veteran’s knowledge and skills with a job that is the best fit for them. If you can find a veteran with military experience in maintenance related fields, you can rest assured that the military has pre-screened them to be skillful workers who will be a good fit for your business. It is hard to imagine a higher-pressure situation than a battlefield. Soldiers are trained to not only execute their mission under high-pressure situations but to also thrive in the chaos. This is one of the most valuable traits that an employee could exhibit, especially on a job site where things can go very wrong. Veterans have a deep sense of responsibility ingrained into them. Soldiers learn at a young age that their actions could have serious consequences. This makes them give more thought to their decisions. Even though they have been taught to obey orders, you are unlikely to find a veteran who is a ‘yes man.’ Their leadership and intuition skills are what makes them speak up if they feel the boss is not making the correct decision or if there’s a better way to do something. Due to their ability to be proactive and take initiative, veterans can take good care of crucial processes in your business without having to be micro-managed. The military is all about structure and organization, and all personnel are trained to embrace that organization from day one. Veterans are equipped with the skills that can help your business attain and maintain structure, so you can operate in an efficient, organized manner. Veterans come from a culture that embodies trustworthiness. This makes them develop the traits of integrity and sincerity at a young age, which stay with them throughout their lives. This is something prospective employers should value when comparing resumes of veterans versus other candidates. Veterans have been trained to be courteous to their comrades while giving great deference to their leaders or superiors. Thus, this is something that comes naturally to them and is what helps them to be effective team members. Moreover, it is a skill that will prove to be beneficial in dealing with customers on the job site. Veterans have been taught the value of accountability. They understand their place within the organizational structure, which makes work easier for their subordinates and superiors. They also understand that policies and procedures are what enables a company to exist. Soldiers are trained to understand the workings of complex mechanisms and work with high-end technology. Thus, they are likely to easily understand and adapt to the technologies used in your business. Hiring an eligible unemployed veteran gives your business the chance to take advantage of tax incentives such as the Work Opportunity Tax Credit and Returning Heroes Tax Credit, which when combined could see your company realize annual incentives of up to $9,600. The government provides veterans with financial assistance if they want to pursue higher education. By hiring a veteran, companies benefit from having employees who can consistently improve while on the job through continuing education initiatives. Many servicemen in the military are placed in leadership positions at a young age. This makes them develop leadership qualities that allow them to confidently direct and motivate others which is very valuable in the workplace. Where Can I Find Veterans To Hire? U.S. Department of Labor. The government actually has a number of helpful tools and programs, like the HIRE Vets Medallion Program that help connect vets with employers. Hire Heroes USA. This is the country’s largest non-profit focused on helping veterans find employment. hireaveteran.com. A huge job board dedicated to helping veterans find employment. Veterans are among the most well-trained individuals in the country. Theirs is a diverse skill set that allows them to work and thrive in most industries and smart contractors can take advantage of this to help grow their business. Realize the benefits of hiring veterans today by employing a former military serviceman.